Reduction of the carbonyl group in oxygenated benzomorphan 1 affords the corresponding alcohol (2). 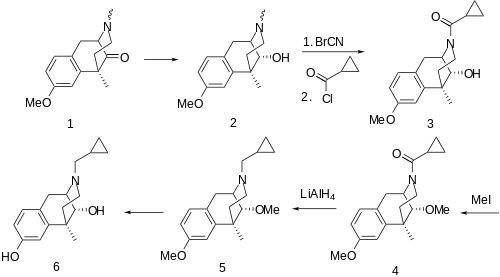 This intermediate is then N-demethylated by means of BrCN. Acylation with cyclopropylcarbonyl chloride gives the amide (3). The alcohol is then converted to the ether by treatment with MeI and base (4). Treatment with LiAlH4 serves to reduce the amide function. Cleavage of the phenolic ether by one of the standard schemes affords moxazocine (6). ↑ Dictionary of Pharmacological Agents Volume 2. CRC Press. p. 1382. ISBN 978-0-412-46630-4. Retrieved 22 April 2012. ↑ Hayes AG, Sheehan MJ, Tyers MB (August 1987). "Differential sensitivity of models of antinociception in the rat, mouse and guinea-pig to mu- and kappa-opioid receptor agonists". British Journal of Pharmacology. 91 (4): 823–32. doi:10.1111/j.1476-5381.1987.tb11281.x. PMC 1853585 . PMID 2822190. ↑ T. A. Montzka and J. D. Matiskella, DE 2517220 Chem. Abstr. 84, 59832k (1976).